The election of Harvard Law School fellow Lobsang Sangay as the Kalon Tripa, or prime minister, of the Tibetan government in exile has been framed as a much-needed repackaging of the Tibetan political agenda to meet the needs of the Tibetan struggle after the 14th Dalai Lama passes away. However, an important new book, Tragedy in Crimson by Tim Johnson, McClatchy's Beijing bureau chief for six years,  questions the effect that the marginalized and impotent emigre government in India will have on the spiral of repression, anger, resistance, and more repression that characterizes the lot of many Tibetan monks and lay people inside the ethnic-Tibetan regions of the People's Republic of China (PRC). Johnson's book is an important contribution to what might be termed an "exit interview" genre of China correspondents. On new assignment, and relieved of the worry of expulsion and conscious and self-conscious self-censorship, Western journalists can be frank in their choice of subjects and conclusions while writing their China books. That wasn't easy while working in China, as Johnson makes clear. While Johnson was still working in China, Chinese diplomats met with McClatchy's chief executive officer to discuss his Tibet book - a book he hadn't announced yet - advertising that they had obtained the information by monitoring his e-mails and phone calls. With this context, it is easy to see why Chinese government claims concerning events in Tibet - indeed any events - receive a less-than-sympathetic hearing from Western journalists and their editors. Johnson's book is especially valuable because of the overarching theme he has chosen - China's ethnic policy, with a focus of Tibet - and, in its first-hand testimony and cumulative detail, providing a unified picture of China's aggressive efforts to secure its borderlands, from Tibet in the southwest to Xinjiang in the northwest and Inner Mongolia to the north. It is clear that China is playing the economic integration card, pouring investment and Han immigrants into the Tibetan, Uyghur and Mongolian regions of the PRC. Inner Mongolia counts as a victory for the Chinese policy. However, in Tibet, Qinghai, western Sichuan, and Xinjiang, the flip side of this economic and demographic incursion is local dissatisfaction, coupled with ferocious repression by security forces. Even if the PRC government had a genuine "hearts and minds" approach to social control, apparently the best and brightest don't end up in China's remote westlands as security personnel and administrators. The Chinese government may be able to build a 21st-century green train across the plateau to Lhasa, but the local cops have the mindset of good, old-fashioned racist goons of the type that used to deliver injustice in the American south. This brings us back to the government-in-exile in Dharamsala, aka the Central Tibetan Administration or CTA, and its capacity to provide leadership to angry and abused Tibetans within the PRC. Especially among frustrated younger Tibetan exiles, there is support for going beyond the Dalai Lama's policy of negotiation with China towards autonomy, and agitating for independence instead. The militant franchise in Dharamsala is held by several non-governmental organizations (NGOs), chief among them the Tibetan Youth Congress, the Gu Chu Sam association of ex-political prisoners, the Tibetan Women's Congress, the National Democratic Front, and the Students for a Free Tibet (India), as well as the charismatic activist/author, Tenzin Tsundue. In 2008, these groups, with the vocal leadership by Tsundue, banded together to form the imposingly named Tibetan People's Uprising Movement. It is time for Tibetans to take control of our future through a unified and coordinated resistance movement. We must now proclaim to the Chinese and to the world that the desire for freedom still burns in the heart of every Tibetan, both inside Tibet and in exile. In particular, the time has come for Tibetans in exile to boldly demonstrate that even after 50 years, we long to return to our homeland. A return march from exile in India back home to Tibet is being organized and will revive the spirit of the 1959 Uprising. The "return march" fizzled under the disapproving gaze of the Indian government, which employed arrests, delays, and permit requirements to make sure the marchers never got near the border. 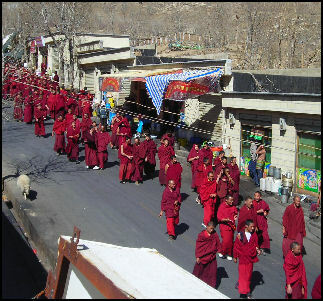 Nevertheless, the commencement of the march - on March 10, 2008 - was also the day that several hundred monks turned up at the Bokhara - the heart of Lhasa - for a silent vigil that promptly deteriorated into a security forces assault and a bloody anti-Han riot that claimed dozens of lives and sparked demonstrations and crackdowns at monasteries and towns throughout the Tibetan areas of the PRC. March 10 is the anniversary of the date in 1959 when thousands of Tibetans gathered to protect the Dalai Lama at the Norbulinka Palace in Lhasa before his flight to India, and serves as a traditional occasion for Tibetans to reflect, make speeches, and demonstrate to protest the occupation of their homeland. The march on the border and the appearance of the monks in Lhasa, therefore, may have simply been a coincidence. Virtually all observers dismiss the TPUM as an amateurish and quixotic venture and question its reach inside China. The TPUM itself disavowed any direction of the unrest inside Tibetan China. However, the Dalai Lama did denounce the violence by Tibetansand went as far as to threaten to resign his leadership of the Tibetan movement if it didn't stop - a stance that would have an immediate effect on incitement emanating from the tiny community of Dharamsala but would have been almost impossible to convey into Tibetan areas of the PRC, given the total communications lockdown put in place by the Chinese government once the riots broke out. In any case, TPUM evaporated as a political presence, and the leaders of the TYC and other groups interfaced with the media solely in their capacities as leaders of their respective NGOs. Today, the consensus is that emigre Tibetan militants, whether affiliated with NGOs or seeking other outlets, have extremely limited capacity in coordinating activity inside the PRC or, for that matter, even engaging in hostile rhetoric, given the desire of the Indian government to keep a lid on Tibetan dissent. There is doubtlessly communication, partly indeed intense communication, between Tibetans within and outside the PRC. Coordination, though, is as good as nonexistent. Tim Johnson speculates that whatever contacts the TYC has inside China, they probably do not extend far beyond the network of returned graduates from the Tibetan Children's Village schools in India. One look at the dilapidated headquarters of the TYC in Dharamsala is all it takes to realize it is little more than a shoestring operation. Its leaders may have a lot of passion but they have little capacity to fulfill their goals. In this context, any rhetorical show of militancy from Dharamsala would probably be welcome to the PRC, as it would provide political cover and justification for the brutal headknocking it metes out to its Tibetan citizens daily as a matter of security and social control. The TYC received more publicity thanks to the Chinese government - which elevated the group to the status of a terrorist organization sowing unrest, propaganda, and weapons throughout Tibetan areas of China in order to justify the 2008 crackdown - than it had enjoyed in the previous 30 years of its existence. It is a paper tiger pushed up by Chinese propaganda in 2008. In Tibet they hardly knew TYC before 2008, and even today they don't really know what this is supposed to be. Despite all solidarity, the gap between exiles and Tibetans inside is huge. Unfortunately, Beijing's discovery of a militant faction among the emigre movement served primarily as a pretext to tar the Dalai Lama with the extremist brush and further delay negotiations with the vigorous but aging leader. Therefore, it appears that Dharamsala will have little ability to further the Tibetan agenda, either through moderation or militancy. I believe some Tibetans hope that an exogenous factor to their own struggle may open a door for them. Whether that is internal strife on the mainland or some other event, they (and we) don't know. And the chances of this may not be great. That is why I choose a term from American football to describe it, that what they seek is a chance at a "Hail Mary pass" in which a losing team attempts an all-or-nothing play to avoid defeat. Clearly that calls for a confluence of circumstances to be successful, as it was for Timor-Leste in 1999. Is such an opportunity likely to open up for Tibetans? I have serious doubts. However, the same escalating domestic repression that is enabled by Dharamsala's lack of diplomatic, political, and organizational reach may elicit such dug-in opposition from ethnic Tibetans that China, sooner or later, may have to deal with it instead of crushing it with truncheons or sweeping it aside with a flood of economic development, Han immigrants, and tourists. We should not commit the mistake China seems to commit all the time, namely to consider that the exile community is the alpha and omega of everything ... . Dissatisfaction, alienation and frustration are the cause for the Tibetan issue. The exiles are a product of that too. They have a role to play, for sure, or rather they can play a role if acting congruously and with a clear sense of purpose and without exaggerating their significance, but real and powerful movement can only come from within Tibet. It is dissatisfaction, alienation and frustration that creates troubles inside China, not the Dalai Lama. Hence that will also go on after his passing away. It appears that moral and political leadership of the Tibetan cause will more and more fall to religious leaders within the PRC. Local leaders said [in 2008] the soldiers amassed at the gates had announced that they would enter the community and hoist China's red national flag over the entire settlement. "The rinpoche told the Chinese that 90% of the monks would kill themselves if their soldiers entered and raised the Chinese flag," ... he warned the holy men and women to hold passions in check. "Every day, he tells monks and nuns, 'Don't do bad things ... Practice compassion, and be patient." The Dalai Lama, who is now 76 years old, made the prediction that he might outlive the PRC. That seems unlikely. But perhaps in the future the PRC will find it necessary to reach out to Tibetans inside its borders and in Dharamsala to overcome the demoralizing consequences of bad policies, bad decisions, and bad karma. 1. Tragedy in Crimson, Tragedy in Crimson: How the Dalai Lama Conquered the World but Lost the Battle with China, by Tim Johnson. Nation Books, New York, Feb 2011. ISBN-10: 9781568586014. US$26.99, 352 pages (hardback). 2. Black Days for the Dalai Lama, China Matters, Mar 18, 2008. Peter Lee writes on East and South Asian affairs and their intersection with US foreign policy.